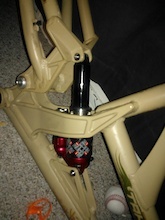 @Krzymndyd: I've had bigger issues with rockshox, Fox, and Marzocchi in the past. I still like their stuff aswell. I'm a big dude suspension takes a beating with me no matter who makes it. There is just something with the DVO that makes it feel better for me personally. I love my DVO. I will say it had a very minor issue after a full season of abuse. I will also say DVO did immediately fixed the issue and did a full pre season service on the fork while they were at it. And didn't even charge me. I saw a bunch of these and their other bikes at Deer Valley over the weekend. I wondered when they got good looking bikes and from what I saw they freaking move. Almost made me want to go test one.